Sew Can Do: Spooktacular Craftastic Monday! AWESOME. That's what I have to say about all the links from last week's Craftastic Monday. Over 100 projects! I ran out of time to comment on more than just a few, but I want everyone to know they rocked the party big time. I'm really looking forward to seeing what you've got this week and to share my Halloween-themed creations with you. Be sure to stop by tomorrow & later in the week for some costume & tutorial fun. I also wanted to say thank you to everyone who commented on my Looking For Linky Parties. Now I've got some fun new places to link up! If you missed that post & have a party to tell me about, just click on that link & add your party info in the comments. Like this sweet little owl costume made by Finding My Aloha. Cuteness overload!! 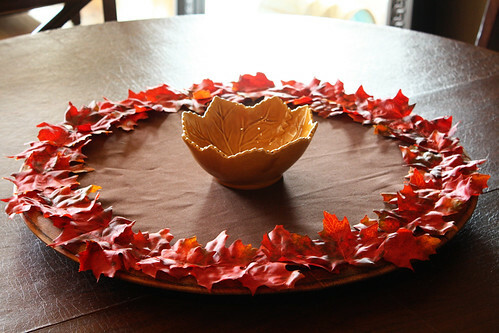 Look at this gorgeous fall leaves cake by Twin Dragonfly Designs. So lovely! 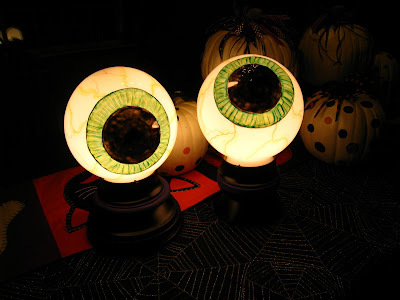 Check out these clever DIY spooky eye lights from Easy Peasy Grandma. I love that cute little owl. Thanks for hosting and have a great week. Thanks so much for hosting this fun party and thank you so much for featuring my eyeball lights! Hi, Cheryl, thanks for hosting a lovely party! I love your picks from last week - way too much talent on here! Thanks! Glad you liked my owl costume!! Thank you so much for featuring it! Im adding your button to the post!